What Are Earth Anchors Used For? Tar Heel Foundation Solution’s earth anchors keep foundations from settling into the ground, which can cause foundation cracks and leaks. Earth anchors are a very economical solution to repairing most cracked or bowing walls. The anchor is designed to restore the functionality of the wall without major construction and excavation. Wall plate earth anchors (below) are a time-saving solution and are not obtrusive and can often be painted over to blend in with the walls and absolutely no square footage is lost. Walls that are showing signs of movement are unstable and are in need of some type of corrective action. There are devices that monitor movement within the wall structure. Let us send an expert to review your bowing situation and determine what we can do to help you solve any bowing that you have encountered. In this job study, we look at Earth Anchor Installation. 5 Earth Anchors were installed on a 15-course CMU wall. The installation process was completed in one day and Tar Heel Foundation Solutions was able to pull the wall back close to 1″ and almost back to its original state. The owner had inquired about other options but all were very time-consuming and much less affordable. 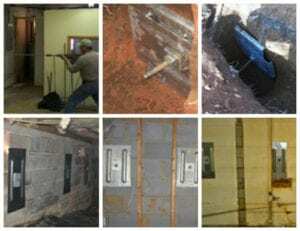 Tar Heel Foundation Solutions structural contractors offer a 10-year, fully transferable warranty against movement in the immediate area of the earth anchors. Click HERE to view the detailed process of earth anchor installation.